A conservative group is challenging Democrat Ed Markey’s Massachusetts residency less than a week before he faces a special election for a U.S. Senate seat in that state. Markey, currently a member of the House of Representatives, should legally be considered a resident of Maryland, America Rising PAC stated in a Tuesday complaint filed with the Maryland state comptroller. The group also claims Markey violated Maryland law by failing to file Maryland tax returns despite living primarily in that state. Markey has vehemently denied that he is officially a Maryland resident. He dismissed information in a debate on Tuesday on his tax returns that showed his primary residence is in Maryland. "Oh, it is Massachusetts," he said. "That was just the accountant who made a mistake." America Rising stands by its complaint. "Markey loves new taxes except the ones he’s not paying to his home state of Maryland," Tim Miller, the group’s executive director, said in an email. 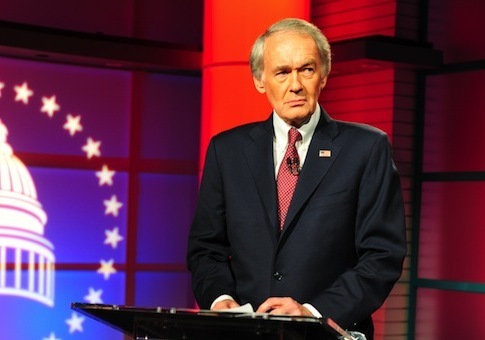 "The Maryland law is explicit and the public record of Markey's residency indicates he may owe taxes in Maryland, not Massachusetts," Miller added. Markey and his wife purchased a home in Chevy Chase, Md., in 1991, according to the complaint. That home was listed as his primary residence until 2001, when he purchased his parents’ home in Malden, Mass. Under Maryland law, a home is considered a primary residence if the occupant spends at least 183 days of the year there. America Rising’s complaint cites news reports that indicate he spent at least 195 days at his Maryland home. Other indicators suggest Markey spends less time in Malden than he claims. "Markey’s Malden water bills suggest he is there infrequently, paying only the monthly minimum for service," noted a February report in the Boston Globe. "House records show that he and his staff have spent less annually from his official budget on travel over the last four years than any of the state’s other House members, which could suggest he travels back to his district less often," the Globe reported. The campaign of Gabriel Gomez, Markey’s Republican opponent, has seized on the discrepancies in Markey’s declared residencies. "Six days until Election Day in Massachusetts, Ed Markey is still trying to fool voters into believing he lives here despite the fact that he lives in a mansion in Chevy Chase," Gomez spokesman Leonardo Alcivar told the Washington Free Beacon in an email. The Markey campaign did not return a request for comment. This entry was posted in National Security and tagged Congress, Ed Markey, Gabriel Gomez. Bookmark the permalink.